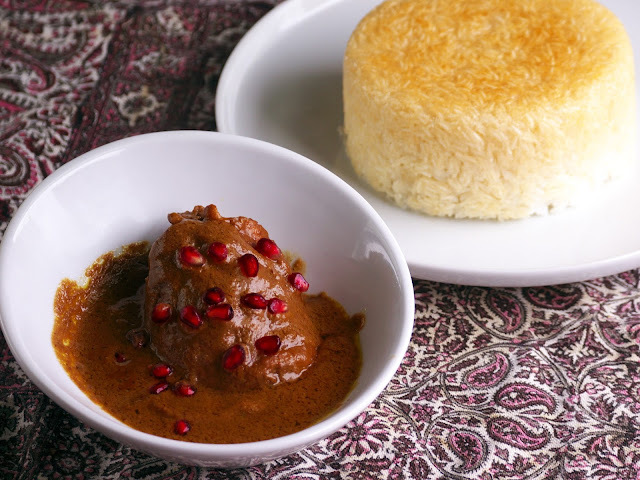 Fesenjoon (also pronounced Fesenjan in formal Farsi) is a luscious Persian stew, comprised of a fruit element (most commonly pomegranate molasses) and some kind of nut (most commonly walnuts). Different types of meat may be used for preparation of Fesenjoon, the most common of which is chicken. Other meat choices involve: beef or lamb chunks, duck (popular in the Caspian region), or meatballs (also popular in the Caspian region), other regional variations may contain fried eggplant or zucchini. 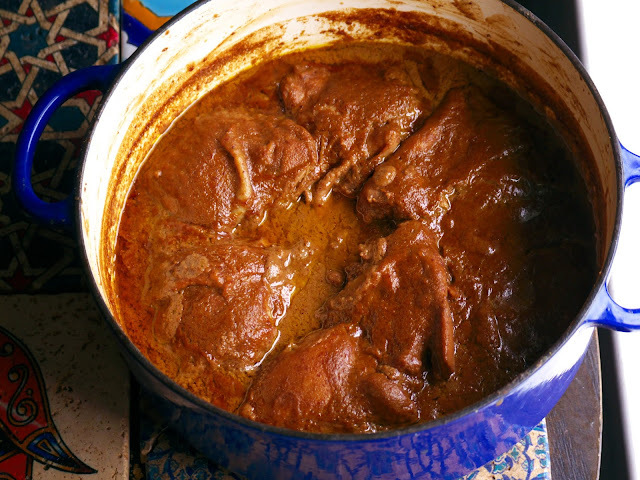 The author is fascinated by the resemblance of Persian Fesenjoon to Mexican Mole. Both the dishes feature long simmered rich sauces, which contain nuts and fruity elements (although the Persian version is mild and aromatic with no chilies included). The essence of both dishes is the essential oils, exuded from the nuts during a long cooking process on low heat. “What is the standard recipe for Fesenjoon?” Opinions differ on the correct answer, as the dish is one of the most disputed Persian food items; some like it sweet, others sour, many others, sweet and sour; some like it smooth, others with chunky walnut pieces. Some recipes might call for up to a cup of pomegranate molasses; others, only a few spoons. Some recipes might call for up to a Pound of walnuts, others, less than no more than a few Ounces. Some prefer to use pumpkin or carrot puree to lighten the sauce; others ridicule such effort, calling it the niggardly restaurant trick to consume less of the expensive walnut. The presented version was designed with two goals in mind: to have a lighter sauce, with a brighter color. The author is not a huge fan of the thick layer of walnut oil, which should traditionally float atop. Therefore, a moderate amount of walnut is used and roasted pumpkin puree is employed to lighten the sauce. 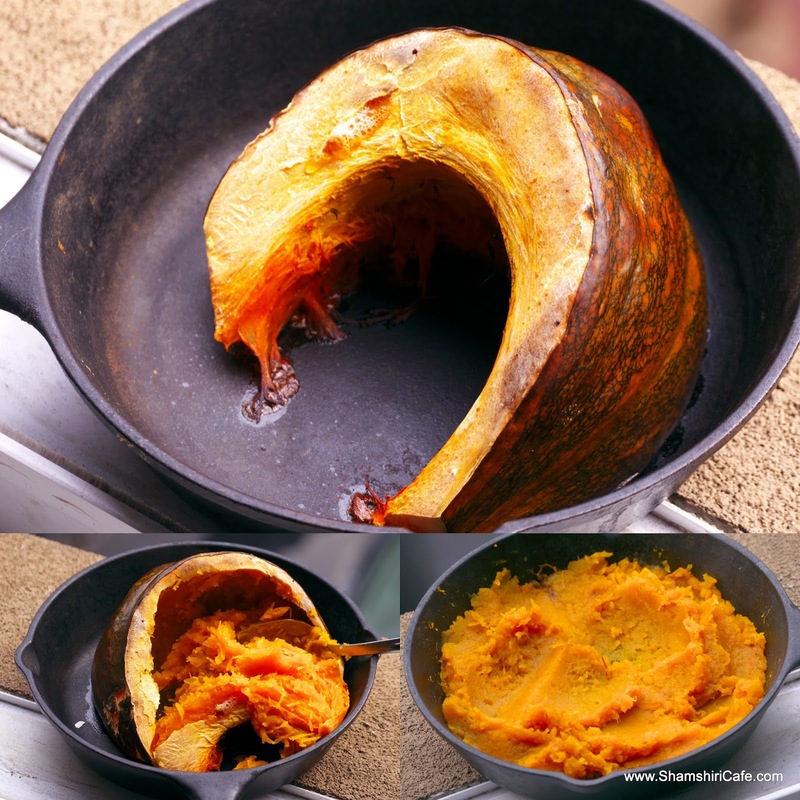 Pumpkin also brightens the color and helps to emulsify the walnut oil. ** Do not use stale walnuts. As mentioned in the prologue, opinions might differ on whether to add pumpkin puree, or not. As I believe it lightens the sauce and brightens the color, I am for it. Given this, I roasted a healthy wedge of pumpkin and made a fine puree. To balance the sweetness of pumpkin, I marinated the chicken in an acidic vinegar/lime mixture. To do so, pour the vinegar and lime in a large bag. Add the onion slices and chicken pieces and marinate overnight. 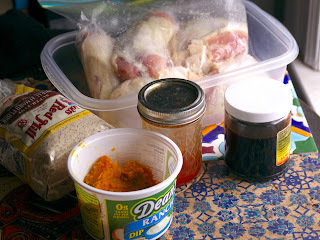 The next they remove the chicken from the marinade. Arrange the chicken pieces in a large pot (in a single layer) and temper to the room temperature. In the meantime toast the walnut meal until lightly brown and fragrant. Browning is the key to a smooth sauce as it helps with the releasing of nut oil. 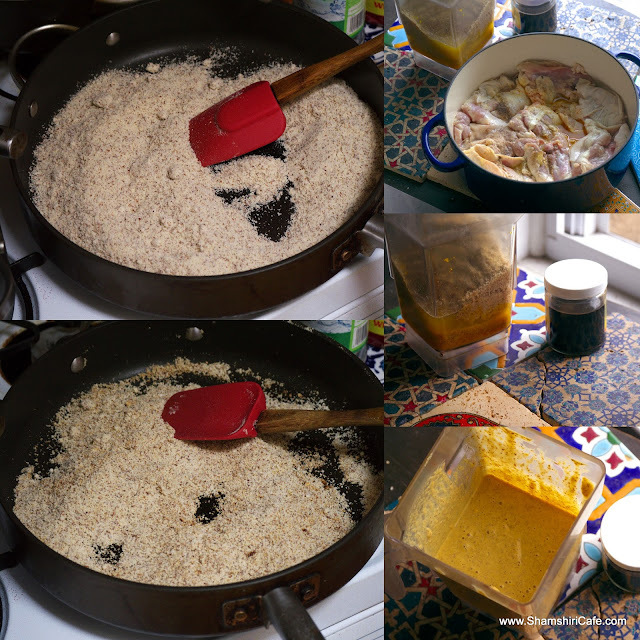 In the pictures shown here, almond meal is used alternatively. Very finely puree the walnut meal, pumpkin puree, and some water. Pour the blender contents over the chicken. Put the pot on medium low heat. Cook, covered, for about 40 minutes or until the chicken is almost done. Add the pomegranate molasses and sprinkle with the cardamom and saffron solution. Uncover the pan, increase the heat to medium, and let the sauce thicken for another 10 minutes. 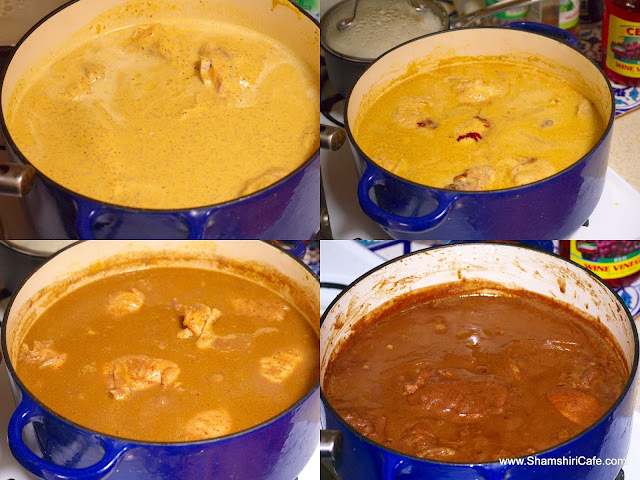 When the stew gets colder, the nut oils tends to be released (as shown above, which shows the stew 20 minutes after being cooked). 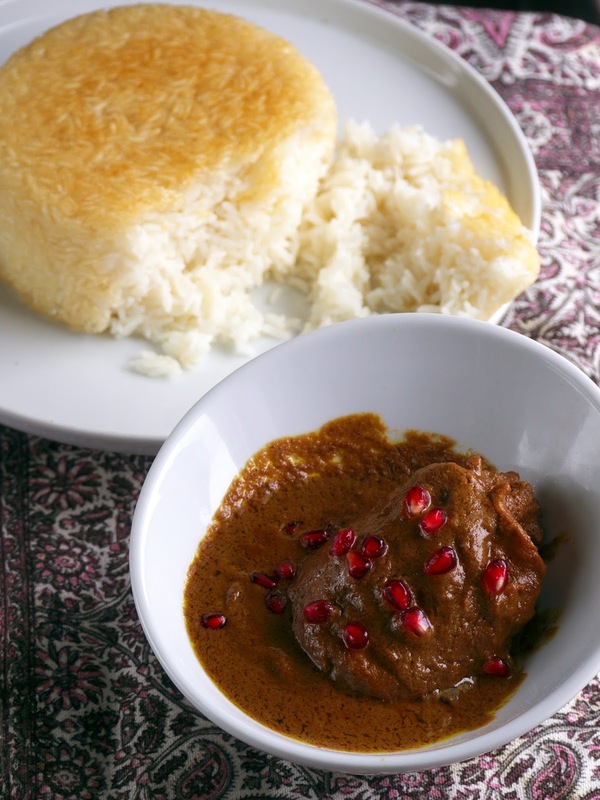 Given this fact, some Persian cooks recommend the addition of a few ice cubes in the final stages of cooking for a sudden temperature drop, which helps with an oil atop final stew. I Personally prefer the oil, emulsified. Pumpkin also helps with the binding of such emulsion.